Happy Monday morning friends! This is definitely going to be a Marvelous Monday! I have a busy one planned for today. I've already started the day with a 5am training session. I have another training session in an hour, a class to teach shortly after that, a couple of training sessions this evening and a nutrition client after that. I'm really loving my work these days. I'm busier than I've been in a long time and it feels so good! There is something so incredibly inspiring working with people that want to make a difference in their lives, seeing them reach for those goals and achieve them! I also feel like I'm contributing more financially. I haven't quite reached my goal yet in that department, but things are growing and that feels good. Knowing this is the beginning and looking forward to the future really helps my mental outlook on things. For the longest time, I felt like I was just kind of wasting time on a dream, but things are really coming together and that makes me happy. Everyday is a new adventure. I'm pretty sure most of my readers that have been around for awhile now are realizing that the recipes are little lacking these days. Life has been busy, so I've started working with quick recipes. Now that things have settled down a bit, I'm gonna share more often. Life is fast and we all need good wholesome recipes for our on the go lives! I promise to be better about this. Speaking of quick, today is my day to share the recipe I made of someone else's from Better With Veggies' MMAZ! I know, again with the kabocha. I will never get tired of this squash. So, my friend Spabettie made this incredibly easy and delicious recipe for Squ-hash Browns. YUM! It's like she was speaking to my soul when she created this one. 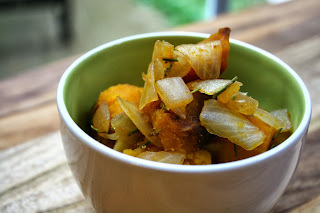 Kabocha, onions and rosemary (my all time favorite herb)! 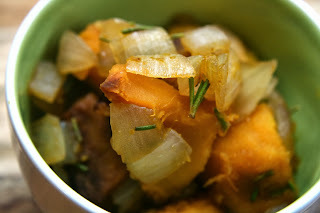 This recipe is so good and I love how beautifully the rosemary compliments the slight sweetness of the kabocha and caramelized onion. I think this little dish may be a new addiction to my Thanksgiving menu. Perfect fall flavors! I did get a little crazy with it and put it on my chickpea waffles topped with spicy mustard and a drizzle of local honey...YUM! Seriously, you guys have got to try this! Mix your dry ingredients together. Add your wet ingredients and mix well. Cook according to your machine's directions. I will be sharing this on Slightly Indulgent Tuesday and Allergen Free Wednesday. Have a great week friends! so glad you liked it - I need those waffles! I am so happy you are busy and thriving, that you feel like what you are doing is part of a bigger plan instead of... hamster wheeling? :) XXO happy Monday my friend! Yum! 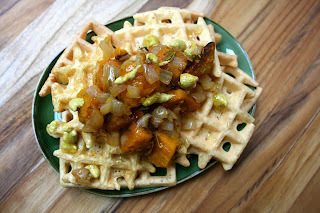 I make savory chickpea muffins and love the idea of waffles! So glad you are thriving-busy. Feels like flying! Oh man. Really? You're such a tease LOL. holy yum. I need this. will you make it for me after kicking my a$$ please? :) I would love that so much. seriously. i totally agree with Kristina. you are thriving in all the right places. Bigger plan indeed. now, i need a waffle maker. Oh friend, nothing is a waste of time if you're working towards your big dreams!!!!! :) Love ya! And these waffles- can we eat these when we hang out together, which better be sometime soon. :) Miss you!!!!! This looks absolutely delicious. Another awesome recipe to make. Love that you incorporated the squash. I can imagine this tastes amazing!!! Those vegetables look amazing - I'm going to make those with sweet potatoes!! 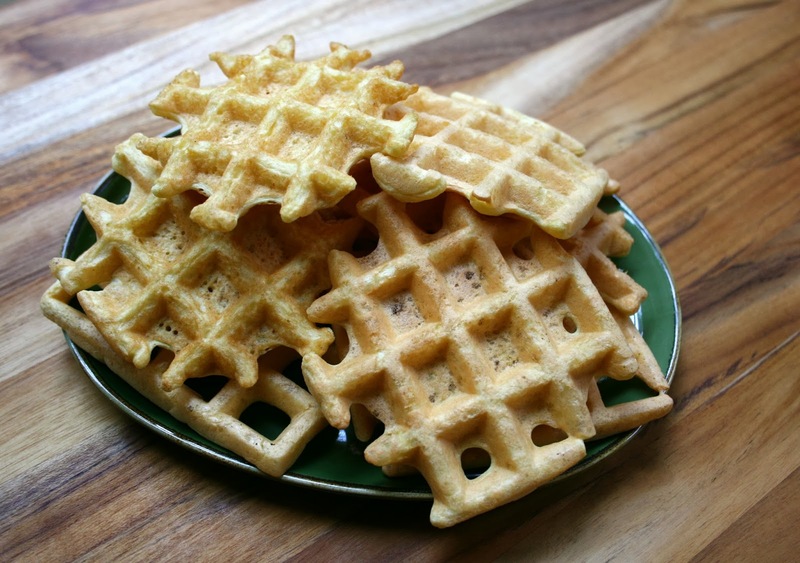 I LOVE savory waffles!!!! I need to make them asap! !